Regular readers know that I love smoky flavors, and I'm always looking for new and interesting ways to work smoke into dishes (without using actual smoke, since I live in an apartment). While we were in Rehoboth Beach last month, I discovered a wonderful new spice store there, The Spice & Tea Exchange. It has a wonderful collection of spices (and probably teas too--I'm not much of a tea drinker), including interesting chiles and even salts. Awhile ago I bought some smoked sea salt, but I've been dissatisfied with it. It doesn't really smell smoky, let alone taste like it. But the hickory-smoked sea salt I bought at Spice & Tea Exchange is incredibly smoky. I've started experimenting with it in different dishes, including sprinkling it on broiled salmon, where it lends the bit of smoke that's missing from not having grilled the salmon over coals. Sweet-and-smoky is a combination that I find particularly fun to play with and which flavors the sauce in this easy stir-fry. Zucchini is good this time of year too, so I wanted to take advantage of that as well. 1. Add the chicken to a bowl and sprinkle with arrowroot powder. Toss to lightly coat and set aside. 2. Heat 1 tbsp. vegetable oil over medium-high heat in a large sauté pan or frying pan until very hot, the oil should almost be smoking. Add the zucchini and sauté until lightly browned, stirring occasionally (but not constantly), about 5 minutes. Remove from pan and set aside. 3. Add another 1 tbsp. oil to the pan. When hot, add the chicken, and sauté until browned, stirring occasionally for about 5-6 minutes. Remove from pan and set aside with the zucchini. 4. Add cashews to the pan and sauté a couple minutes until they start to brown a little bit, then add the garlic, ginger, white scallions and red chili pepper flakes and sauté about 30 seconds to a minute, stirring constantly, until fragrant. 5. Stir together the remaining 2 tsp. of arrowroot powder in a small bowl with the soy sauce, vinegar, honey, sesame oil and warm water. Add to the pan. When the mixture starts to bubble and thicken, reduce the heat to medium. 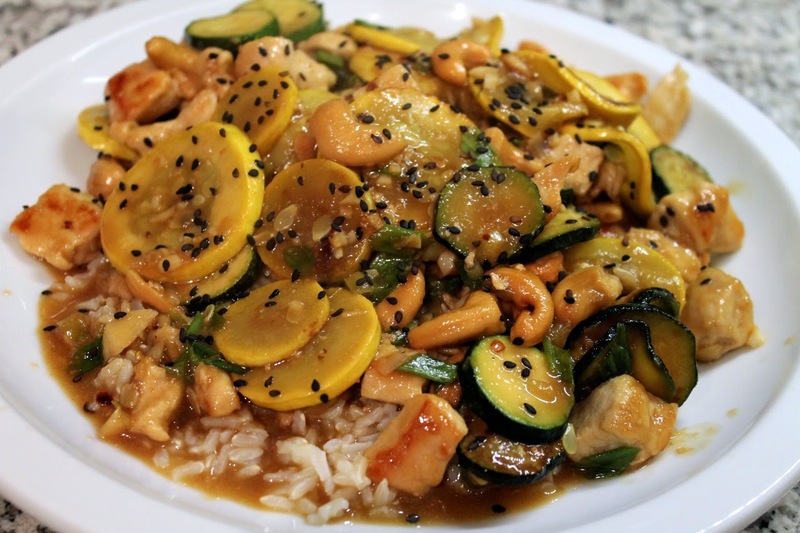 Add back the sautéed zucchini and chicken and stir to combine with the sauce and heat through. Turn the heat off and add the chopped scallion greens. Serve over white or brown rice topped with a sprinkle of black sesame seeds.